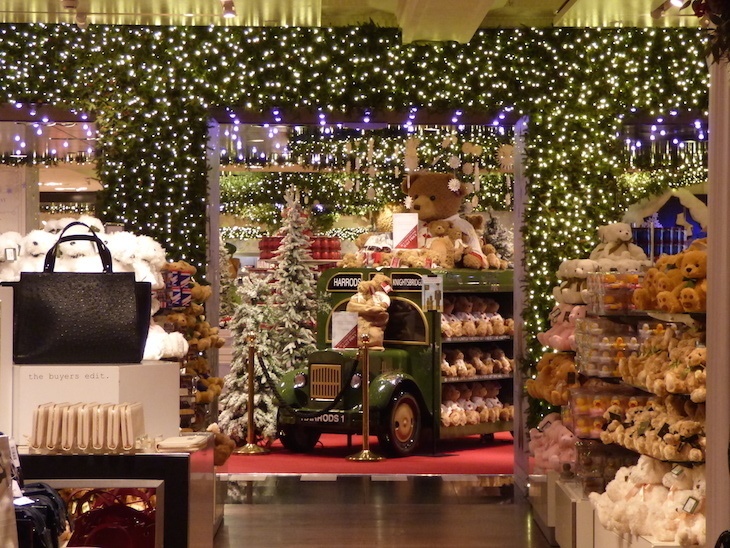 Which London Store Has The Best Christmas Department? 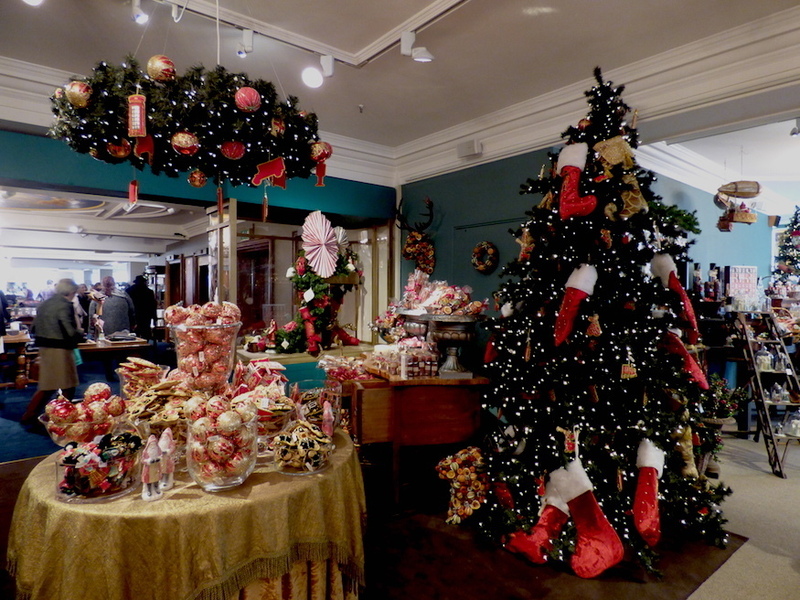 Laura Reynolds Which London Store Has The Best Christmas Department? In 2015, we pitted the big five London department stores against each other. This Yuletide, we're back with our clipboards and cameras, inspecting the Christmas departments at Fortnum & Mason, Harrods, Harvey Nichols, Liberty and Selfridges. Quality of Christmas music (if any) being played in the department. Price range (determined by cheapest and most expensive tree decoration). Ease of locating the Christmas department within the store. Size of the Christmas department (Too small? Too big?). The most ridiculous novelty gift we can find in the department. Selection of cards and gift wrap. Is there a Santa's grotto, and if so, how good is it? How well decorated the shop itself is. Which store will win (and which is best avoided altogether)? Read on. 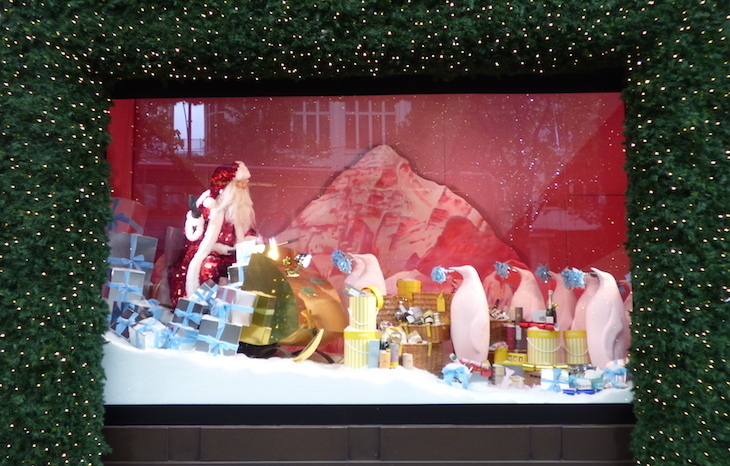 Fortnum & Mason's external Christmas decorations are minimal, but when your face is pretty without makeup, why overdo it? The in-store decorations don't hold back — they're the classiest and most traditional of all five stores, and accompanied by a festive scent to boot. 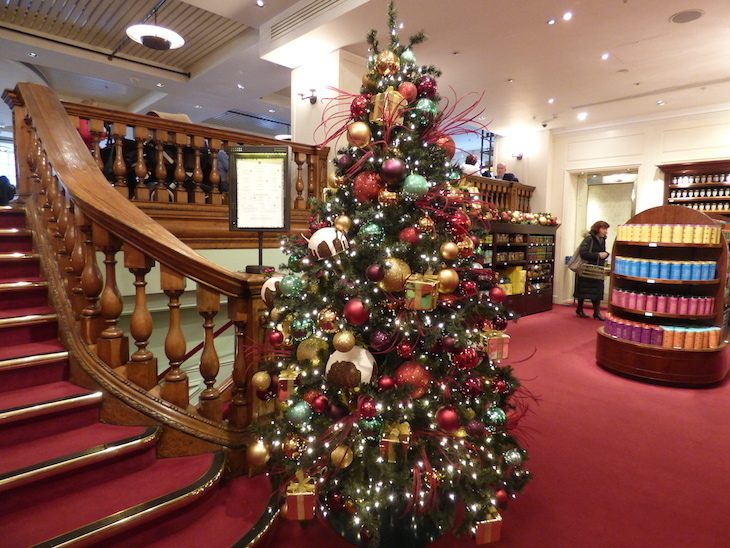 Red and gold baubles decorate several trees, and holly adorns the store's wooden staircase, leading up to the Christmas shop on the third floor. Pick from Mr Fortnum or Mr Mason — or splash out on both. As we're browsing the personalised bauble options, we find ourselves humming along to Here Comes Santa Claus, and just as we thought it couldn't get more perfect Christmas, the dulcet tones of Bing Crosby pipe up. 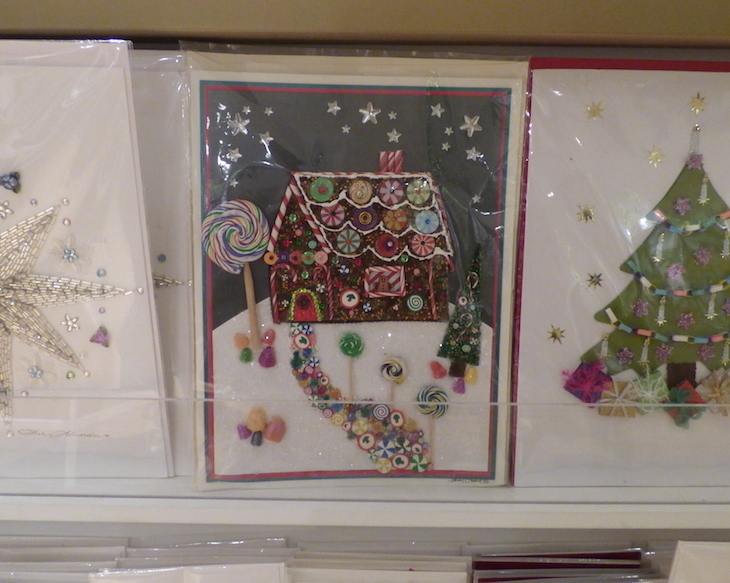 F&M has a decent choice of Christmas cards, including a large range of charity cards for the more benevolent shopper. Prices range from £3-£10 for individual cards, which sit alongside beautiful wraps, ribbons and bows. Nearby is an excellent (although pricey) range of advent calendars. Picture calendars start at £16, with the more exciting whisky one priced at £160. A fill-it-yourself wooden rendition of the Fortnum building will set you back £96. The man in red wasn't in residence when we visited, but F&M goes further than your average grotto offering Storytelling with Father Christmas sessions in the run-up to the big day. Where Fortnum & Mason lets itself down is its gift range. The focus is on traditional, retro toys — good fun, but nothing unusual. A handful of marbles is your best bet for your work Secret Santa. Burberry is the fashion force behind the Christmas windows and tree this year, which are as classy and understated as you'd expect. Once inside, follow signs to the Godiva Chocolate Cafe; it's slap bang in the middle of Christmas World. Two 6ft stuffed bears and Kylie crooning Santa Baby welcome us to the festive department, followed swiftly by renditions of Frosty the Snowman and Let It Snow — good, solid Christmas music. This store knows its (predominantly tourist) audience. Could you be tempted by a Harrods egg cup (£5.95 — egg sold separately), or a Harrods apron (£14.95)? Branded pens, notebooks, umbrellas, and keyrings cover the budget end of the spectrum, but a large portion of the gift section is dedicated to bags and wallets — some classy, others less so. 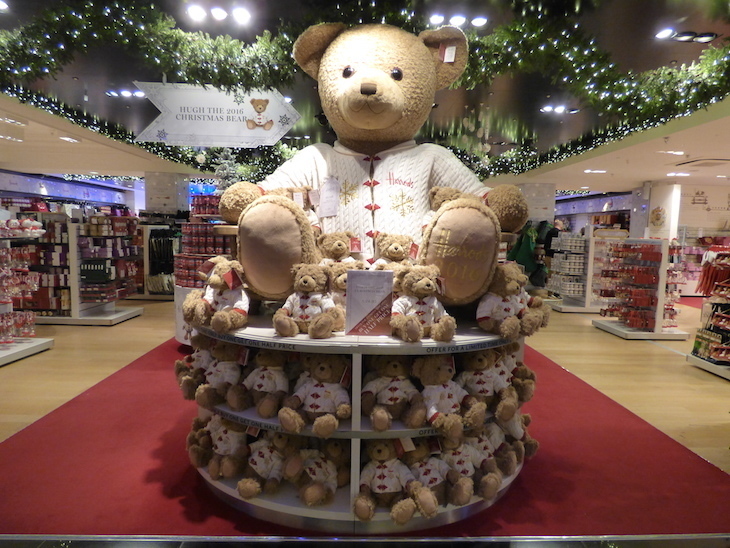 Hugh is this year's Christmas bear, and not too pricey at £24.95 for a 12" bear. If little Hugh isn't enough for your child, you can buy the larger one for a mere £1,200. Harrods doesn't really do novelty gifts (do Harrods-branded golf balls count? ), but that's not to say the buying department doesn't have a sense of humour — we spot some sprout Christmas crackers later on, but at £39.95 for six, it's an expensive joke. Just as we've finished with gifts, we turn around and the full force of Christmas smacks us in the face. Inside Christmas World there's a personalisation counter, where you can get hessian gift sacks, stockings and baubles personalised — but we've no idea of the price as there was no-one serving when we were there. What Harrods covers in (self-promoting) gifts, it lacks in cards. A disappointing selection ranges in price from £3.95 to this one at £99.95. No, that's not a typo. It's art, apparently. That's a £100 card you're looking at. By contrast, the most expensive tree decoration we could find — and believe us, we looked — is a metallic red VW Campervan costing £24.95. 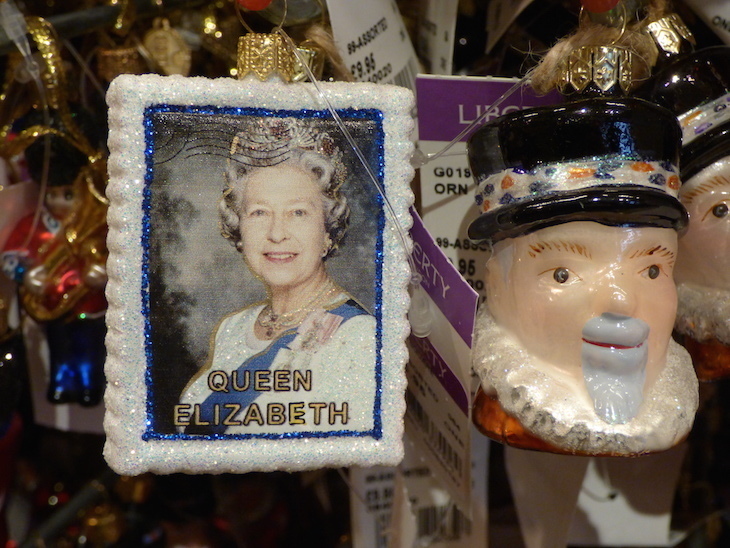 The cheapest baubles are £7.95. That tiger decoration will set you back £179. 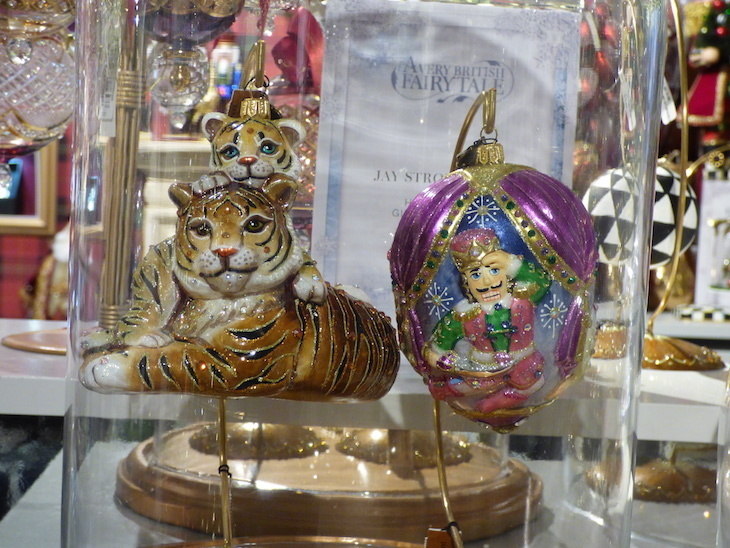 Other bauble offerings include robots, NYC taxis and gaudy golden zebras, none of which we recall featuring in the Nativity story. Two floors up, Christmas has one last hurrah in the form of Santa's grotto, cleverly placed so that families queue through the Disney department ("mum, dad, pleeeease can I have..."). We didn't see the man himself, but the sell-out reputation and queue at 11am on a Thursday suggest that this is one of London's better Christmas grottos. The extent of the Harvey Nichols Christmas department. We don't think anyone's told Harvey Nics about Christmas yet. Sure, there's a bit of extra glitter in the windows, but guys, do you want to introduce your shop dressers to a bit of tinsel or a Christmas tree? The exterior barely acknowledges Christmas at all, so it's a relief to find a listing for the Christmas Boutique on the fourth floor. Finding our way up there is easy enough, but our arrival is underwhelming. 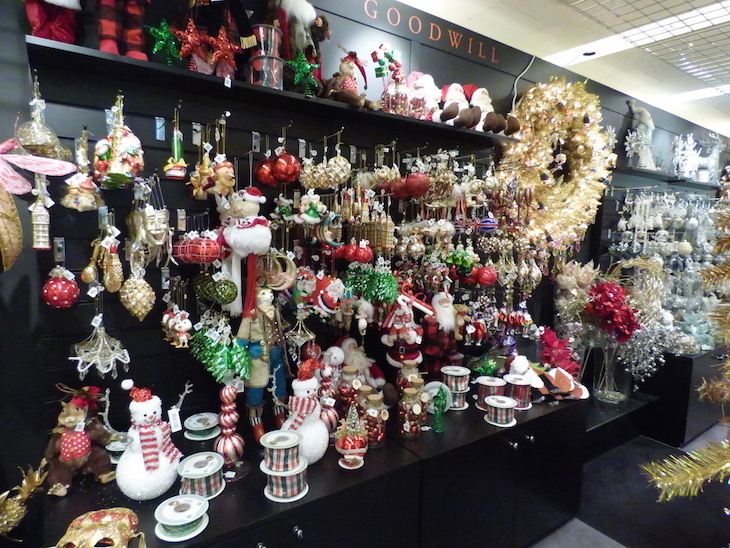 A colourful wall of Christmas tree decorations greets us, ranging from £4-£20 in price... and that's it. Across the walkway, a separate — and extremely serious — boutique section offers gift wrap, but a disappointing lack of Christmas cards. And that's the sum of Christmas at Harvey Nichols this year. Bah, humbug! Is this a post-modern attempt at snow or something? Liberty shoppers are greeted by life-sized Nutcracker soldiers flanking the entrance doors, although once inside, there's disappointingly little in the way of festive cheer anywhere but the Christmas department. Signs announce Christmas on fourth floor, so up we go. Nightmares aside, decorations are organised vaguely by theme (animals, colours), with prices ranging from £3.95-£35, but otherwise it's a bit overwhelming. 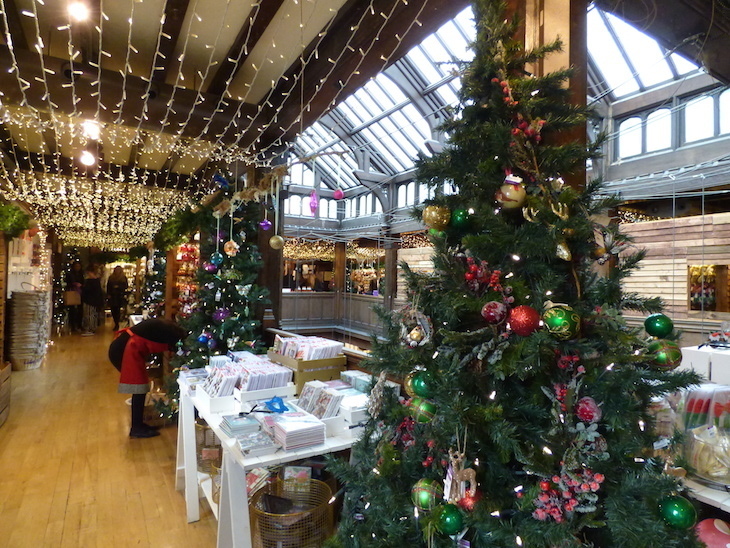 The wooden Liberty interior carries off Christmas well, decorated with a twinkling canopy of fairy lights and a smattering of Christmas trees. The gift department is pretty standard, offering chocolate and posh tea that generic aunties and grandmas will dutifully pretend to appreciate, along with Liberty print crackers and wrapping paper (the small selection of cards barely warrants a glance). Board games, books and calendars are all readily available, but as far as novelty gifts go, your best bet is the clockwork racing snails. True Christmas music is sacrificed in place of The Nutcracker, but that's basically the same thing, right? Liberty loses points for having no Santa's grotto, for what is Christmas without the man in red? Selfridges had won itself some points before we'd even left Londonist Towers, by opening at 9.30am on weekdays — none of the others on this list open until 10am, so it's a good starting point for those wanting to beat the crowds. The shopfront has been blanketed by Christmas itself. Disco Santa makes several appearances in the Oxford Street windows, which should serve as warning enough that this is not a place to visit on a hangover. The iridescent branding of the Christmas department only confirms this suspicion. 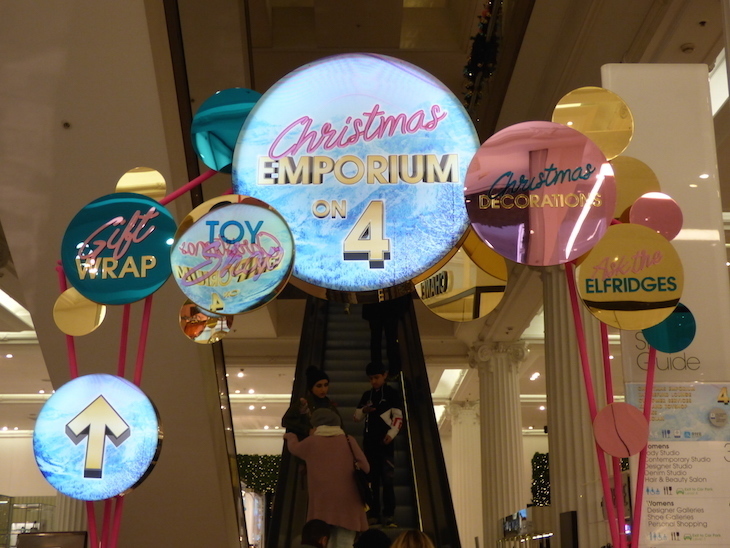 Unlike some of the other stores, Selfridges definitely wants you to find its Christmas Emporium — stickers on every entrance door announce to the world that it's on the fourth floor, and once you're inside, the helpful signage increases, making it the easiest Christmas department to locate. It's also open plan and easy to navigate. Glitter rules, with every handrail and balcony throughout the store hedged with silver, gold, pink and blue baubles. 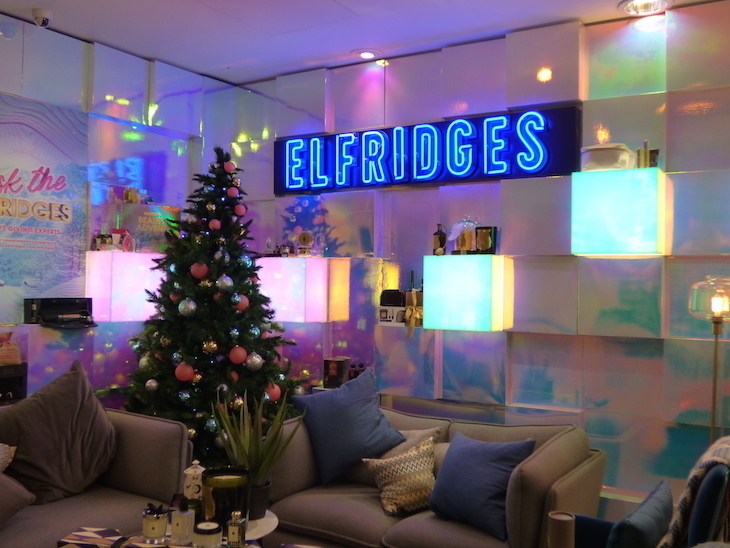 The Christmas experience begins with Elfridges personal shopping, quite a slap round the face, but easily bypassed if it's not for you. The section then begins the serious business of decorating. 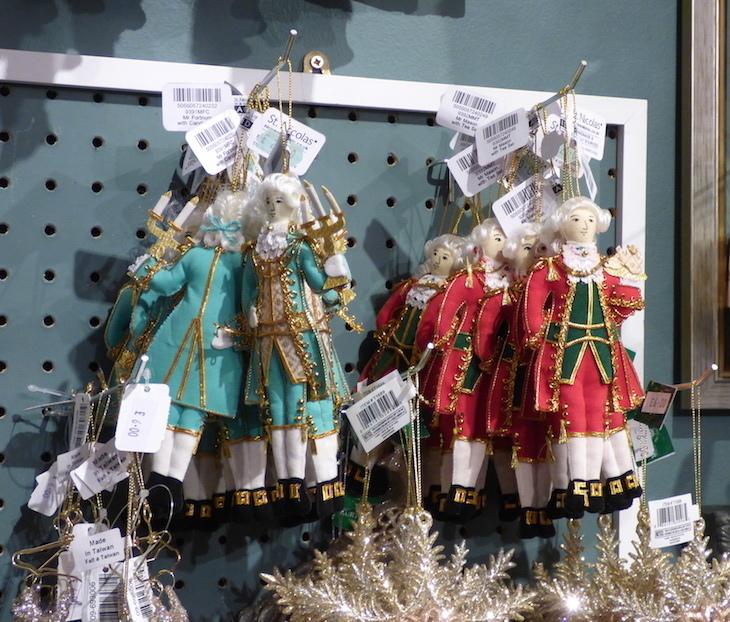 Tree decorations range from £4.25-£17.50, and are helpfully arranged in bays by theme (metallics, woodland). Selfridges is the best for quirky and novelty gifts, both in range of interests and prices. Adult roller skates tip the steeper end of the scales at £95, while other quirky gift ideas include paint your own kite (£12) and make your own periscope kits (£16). The Secret Santa office staples (desktop football £7.95, giant cocktail glass £15) are all present and correct. Selfridges seems to be playing on every adult's Christmas wish to revert to childhood, and it's working. There's no grotto as such, but you can book events such as Breakfast with Santa and Santa Stops. 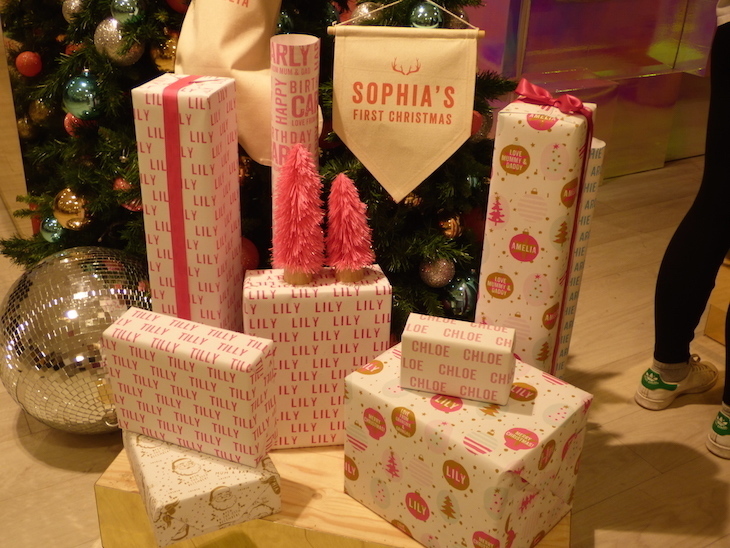 Thrill your little ones further with personalised gifts (from £6), or wrapping paper with their own name on it. The card and wrapping section is well stocked, offering packs of charity cards, or individual cards ranging from £2.95-£8.75. The party section is also worth a mention, offering dressing up items, photobooth props, board and drinking games. There's no Christmas music, just the same pop songs that play in the rest of the store, but we can overlook that as Selfridges was the only place where we saw staff wearing Santa hats and reindeer antlers. 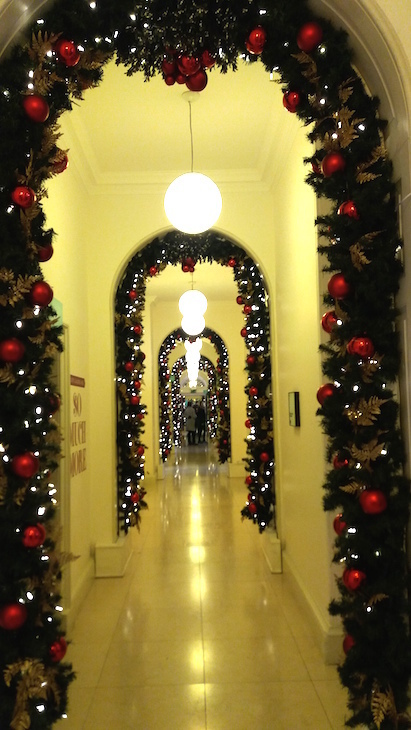 Is this London's most festive corridor? It's worth pointing out that we carried out this research in mid-November, and these ratings are based on what we saw that day. Things could get a lot more Christmassy in any — or all — of these stores before the big day finally arrives. You've been warned.